Crown vetch (Securigera varia) is a non-native perennial plant in the legume family. It was introduced into the United States in the 1950s primarily for erosion control along roads and waterways. Crown vetch is currently found in all U.S. states except Alaska and North Dakota (USDA Plants Database 2014). The invasion of crown vetch into natural areas, such as prairie grasslands, barrens and dunes in Midwestern states, is having a significant impact on native plant diversity. The plant is a prolific seed producer and spreads by seed and vegetatively by rhizomes. Crown vetch is capable of covering small trees, shrubs, and grasslands eventually forming large single-species stands that modify soil nutrient levels and alter fuel loads in fire-adapted ecosystems. The plant tolerates a wide range of environmental conditions, but grows best in areas with 18 inches or more precipitation. Crown vetch has diffuse stems that spread to about six feet in length and three feet tall. Leaves are dark green and odd-pinnately-compound, with 9 to 25 leaflets per leaf. Roots are multi-branched with fleshy rhizomes. The plant flowers from late spring through summer; individual flowers are pea-like and vary from pinkish-white to deep pink in color. Seeds are produced in slender, linear, jointed pods (loments) that may reach two inches in length. The length of time seed remain viable in soil is unknown, but high soil seed banks have been reported. Dr. Mark Renz of the University of Wisconsin conducted field trials near Barneveld, Wisconsin to study efficacy of Milestone® specialty herbicide applied to crown vetch at three growth stages. Milestone was applied at a spot treatment rate of 9 fluid ounces per acre (fl oz/A) to crown vetch at the bud (June), flower (July), and fall (October) growth stages in 2012. Individual plot size was 10 by 30 feet, with four replications of each treatment. Evaluations included visual percent control and cover of crown vetch, and percent visual injury to grasses at one to two years following treatment. Figure. Percent control of crown vetch one year after treatment with Milestone® herbicide applied at bud, flower and fall growth stage. Results of the study showed that Milestone applied at either bud or fall growth stage provided excellent control one year after treatment (see Figure). 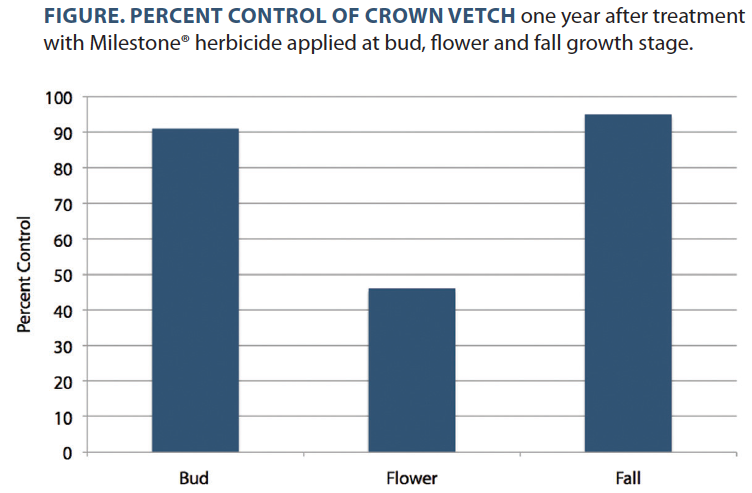 However, only the fall herbicide application continued to provide good crown vetch control in July 2014 (two growing seasons following treatment). There was no grass injury noted in plots resulting from the herbicide treatment. These results indicate that fall is an excellent time to control crown vetch with Milestone herbicide. Follow-up herbicide application may be necessary to control seedlings emerging from the soil seed bank or mature plants that survive treatment. Disturbed sites or areas without desirable understory vegetation may require restoration to create a competitive desirable plant community and improve the potential for long-term control. For broadcast applications, the Milestone maximum label rate is 7 fl oz/A. Rates up to 14 fl oz/A may be applied to weed infestations; however, not more than 50 percent of an acre may be treated at that rate. In areas with residual desirable vegetation, post-treatment restoration efforts may not be necessary. Milestone is not registered for sale or use in all states. Contact your state pesticide regulatory agency to determine if a product is registered for sale or use in your state. When treating areas in and around roadside or utility rights-of-way that are or will be grazed, hayed or planted to forage, important label precautions apply regarding harvesting hay from treated sites, using manure from animals grazing on treated areas or rotating the treated area to sensitive crops. See the product label for details. State restrictions on the sale and use of Milestone apply. Consult the label before purchase or use for full details. Always read and follow label directions.